It is hard, at first, to see where Sagittarius, the ruling sign of this card, fits in. Sagittarius is an expansive sign and Temperance is, on a surface level, about “tempering.” Butler points out that the original pouring from cup to cup might have been about cutting wine with water. So this is a card about moderation. There is, however, another angle to the card, that of merging seemingly impossible opposites. Sagittarius, the centaur, merges beast and man into a unique creature. And then there is the bow and arrow, one moving, one stationary, working together to point the way. 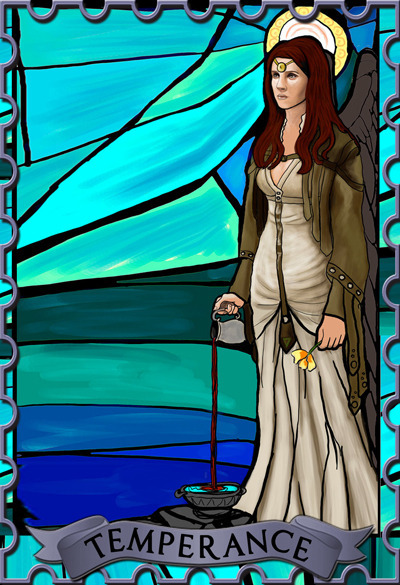 Temperance may be, at first glance, a warning to the Querent to “temper” their behavior, to cut their wine with water. But it may also be a reminder to the Querent that seemingly irreconcilable opposites may not be irreconcilable at all. Belief that fiery red and watery blue cannot be merged may be the only thing standing in the way of blending the two. Change the belief, measure out each with care, and you can create otherworldly violet. Taken from one of the promotion shots for Anna. Designed into a sort of church window with various sorts blues and light violets in the background/Digital painting. Photoshop elements 5, aiptek tablett, 2,5 hours.